We were playing on Cleverbot the other day and it got us thinking about how complex language really is. We've already mentioned that recognising speech is near impossible and translating it with a machine or programme is nigh on impossible. So why is it so difficult? The Turing Test is a method used to gauge how authentically a machine or AI can replicate the behaviours of a human and Cleverbot is trying to pass this test. If the user cannot distinguish it from the natural behaviour of a human it can be said to have passed the test. 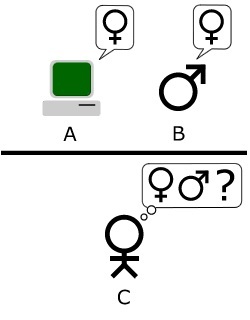 One of the permutations of the Turing Test. If you type a message into a terminal you should be able to tell if the invisible person on the other end of your conversation is a man or a machine. If you cannot, then the AI has done its job in pretending to be human. Of course, this method also depends on the human gauging whether or not the answers are coming from a machine. If you showed someone Siri in the early ages of the telephone they would have been more inclined to think it was an operator sending the information since they wouldn't have been familiar with search engines or speech recognition software. In the modern era we expect these things, so the Turing Test has become significantly more difficult. Even simple commands that can be recognised such as "call person x" or the rendering of speech into text would baffle the Victorians. We wouldn't advise showing a caveman your smartphone immediately after he's been thawed from the ice, either. A flaw with the test is that when it comes to man versus machine, a non-native speaker of a language could be misdiagnosed with displaying all the hallmarks of a machine due to their irregular usage of vocabulary on unnatural sentence structures. Language is a complex structure and, just like your favourite song, even if you know all the words it doesn't guarantee that you'll be any good at it. It becomes even more complicated when the communication is bilateral. You have to take in information, process it, find the correct information, find the correct words, put them in the correct order and execute this all in either the written or spoken form. Even when technology seems to be able to do it all, it can often fall short of being comparable to the real thing.